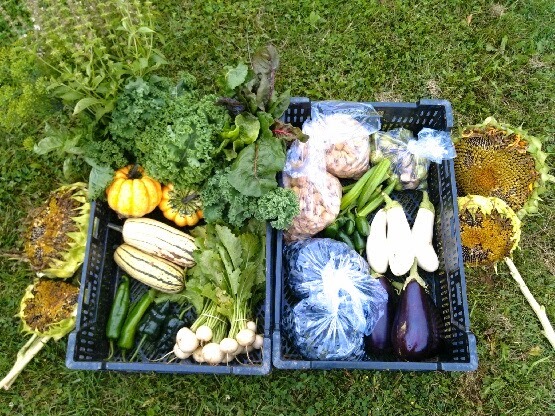 This is our last CSA share for the year for produce and egg shares, we had three frosts the past week that killed off most of the garden. We've had a bountiful year and enjoyed many new crops. Looking back through the shares, we've almost had a new crop in the shares every week! 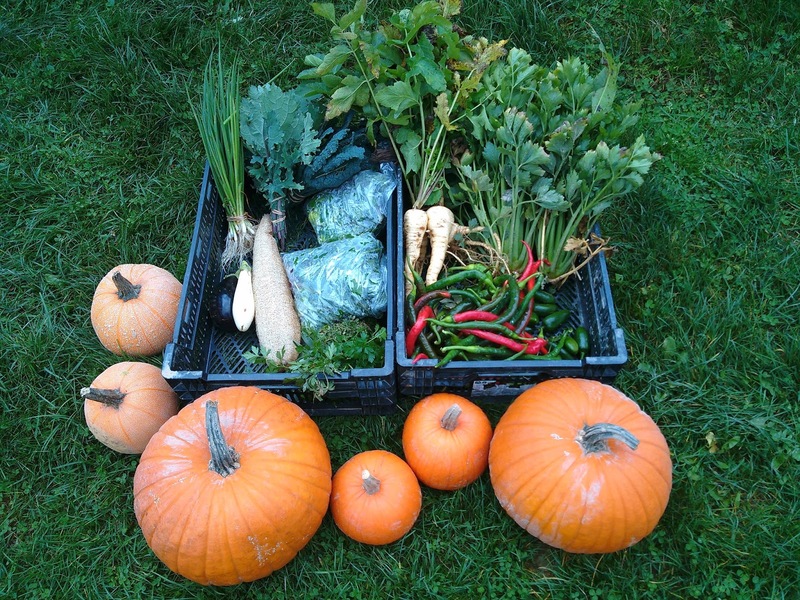 This week we have 3 new crops for everyone, Jack O' Lantern pumpkins, parsnips, and luffa! Large Share Pictured: Jac-O-Lantern Pumpkins, Pumpkins pie pumpkins, green onions, kale, green's mix, luffa, eggplant, parsnip, celery, jalapenos, cayenne, parsley, sage, rosemary and thyme. It's been a rainy and cool but very successful season for us here at The Shire, but all things must come to an end. Compared to last year, we went 2 extra weeks longer and have had all around larger and more diverse shares this year. We have been very happy with our results and hope you all have been as well. We certainly had some disappointments, deer repeatedly eating the Swiss Chard, late blight hitting the tomato crop, our fruit trees not setting fruit due to the cold winter and strong storms during blossoming. The cool weather didn't favor melons this year, but was great weather for our greens. Our root crops didn't do that well this year, but as we work to improve the soil--adding compost and organic matter and removing all the rocks--this will improve over the years. 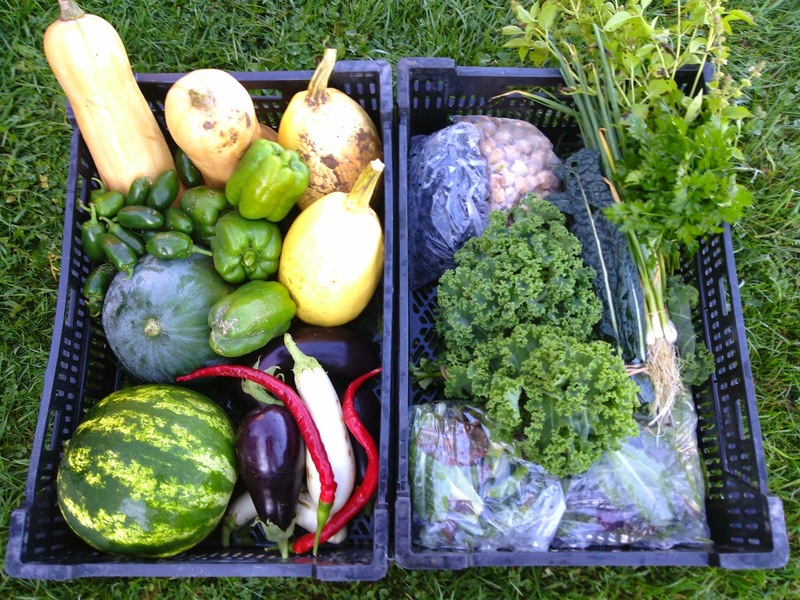 We had great greens for most the year, lots of new fruits and veggies, and better results with our winter squash. We really enjoyed feeding and sharing recipes with all our CSA members. We'll be sending out an email soon with a questionnaire about your experience this season. 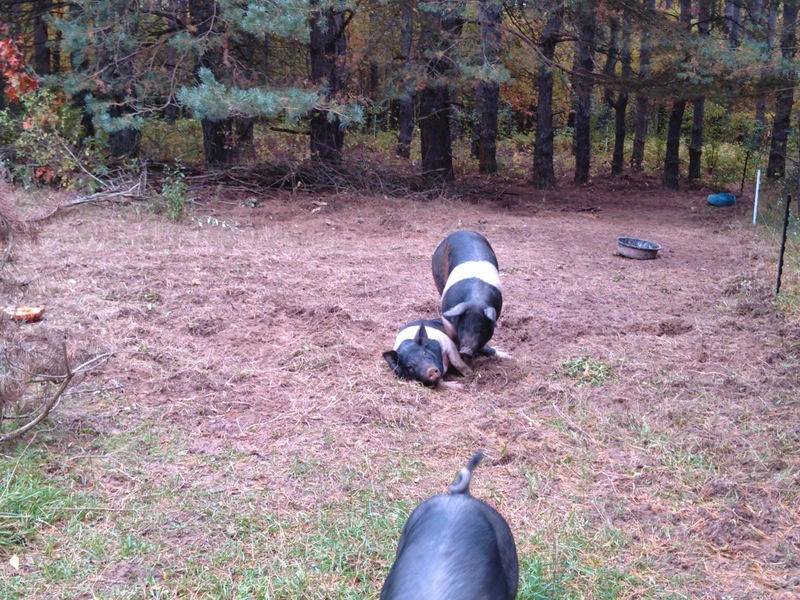 To our Full Diet Shares, the pigs still need another month or so before they head to the processor. They've been enjoying being raised on pasture and in the woods this year, eating raspberry leaves, red currants, mushrooms, and acorns, but they're not there yet! NEW THIS WEEK! This root vegetable is similar to a carrot but they have a sweeter taste, especially when cooked. Parsnips can be eaten raw, but more often are cooked. They can be baked, boiled, pureed, roasted, fried, steamed, mashed, used in stews, soups or casseroles. It's long tuberous root is cream-colored skin, and it used to be used as a sweetener before the arrival of cane sugar in Europe. NEW THIS WEEK! A special request this year, we grew these from donated seed from one of our CSA Members, and had fairly good success in the greenhouse. These are the same luffa that you use in the bath as a body scrub, I bet you didn't realize it's a vegetable though! Loofahs or luffas are made from the dried fruit from the plant, it is also eaten around the world when its green and mature, often fried or in curry. They may require a little more drying time so leave in a well ventilated sunny area that will allow them to dry all the way out before taking it in for bath time. NEW THIS WEEK! Jack-o-Lantern pumpkins just in time for Halloween carving! Lettuces, mizuna, baby kale, tatsoi, arugula, and spinach, what a mix of greens for a delicious salad! Celery is used around the world for the crisp leaf stalks, though in Europe it is more common to grow it for its bulb. The leaves are strongly flavored and can be used as a flavoring in soups and stews or as a dried herb. Celery can be stored for up to seven weeks in the fridge. Celery, onions, and bell peppers are considered the holy trinity of Cajun cuisine, or, try celery, onions, and carrots for the base of a great soup! More green onions this week, goes well in everything from a salad, an Italian dish, Mexican, or a stir-fry. Lots of peppers this week! This week we havlots of jalapenos for more jalapeno poppers, and lots of cayenne. Tie these up in bunches and hang in a dry area of the house, we use the pantry, and let them dry. Once they've dried out go ahead and throw in a food processor or use a mortar and pestle to create cayenne powder. or red pepper flakes. We have a dark purple variety and a white variety, perfect for ratatouille or eggplant Parmesan. Raw eggplant can have a somewhat bitter taste, but becomes tender when cooked and develops a rich, complex flavor. The flesh is smooth and meaty, capable of absorbing large amounts of cooking fats and sauces, making for very rich dishes and making it a great meat substitute for vegan and vegetarian dishes! This green became a favorite for us at the farm Farmer Don certainly came to love it. There are many great ways to enjoy this super food, which is loaded with vitamins. You can of course eat it raw, or throw it in a juicer. We really enjoy throwing it in the cast iron with butter, salt, pepper, and some red pepper flakes and sauteing for a few minutes for a great side to any meal. It is also a great healthy snack when you bake them into Kale Chips. We've got bunches of Parsley, Sage, Rosemary and Thyme this week, enjoy! We finally got to have an herb bundle that matches the Simon and Garfunkel song! We've had two light frosts on the farm this week; the leaves are turning colors, falling and blowing about as fall asserts its presence. For now the garden is still going, there is still lettuce, arugula, celery, pumpkins, eggplant, peppers, carrots, parsnips, green onions, and ground cherries to be had, but this week we're seeing the last of the acorn and spaghetti squash. Cure these in a sunny window to preserve them for enjoying in the winter. We also had a barn cat give birth to a litter of 7 kittens earlier this week. We won't be needing that many mousers, so please let us know if you are interested in adopting a kitten! kale, bell peppers, cayenne peppers, jalapeno peppers, kohlrabi, Anaheim peppers, lemon basil, italian basil, tarragon. 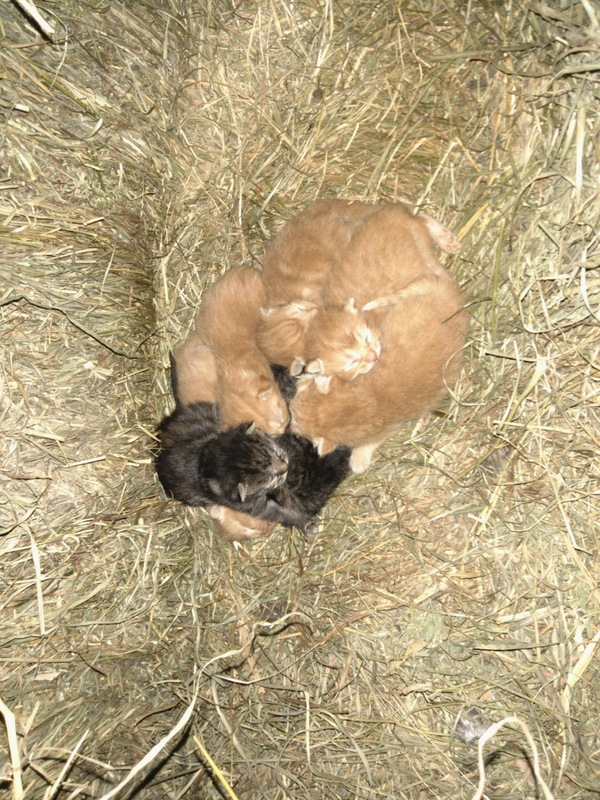 Our new barn kittens are keeping warm in a fort of hay in the barn. Let us know if you're interested in adopting one! NEW THIS WEEK! Leeks are in the same family as onions and garlic, they have a mild onion-like taste. The white base of the leaves and light green parts are the best edible parts, however the dark green portions can be sauteed or added to stock. It's popular for adding flavor to stock, but it is also enjoyed boiled, fried or eaten raw. Try some delicious potato leek soup this week! The word Kohlrabi is German for cabbage turnip, and it can be eaten raw or cooked. We usually eat them raw, just peel off the skin and slice them like an apple and sprinkle with a little salt or dip in your favorite dressing and enjoy! They're also great raw on a salad, or roasted, or baked. This has been a surprisingly popular crop. This interesting garden specialty is from the tomato family, and luckily has so far been unaffected by the blight. These small paper covered fruits have a super sweetened tomato flavor, which is closer to a strawberry and has the smell of cantaloupe. They are fantastic added to vanilla ice cream. These beautiful squashes are as good to eat as they are to use as a fall decoration. The acorn is a rich squash that is ideal as a side dish along a nice roast chicken as part of a fantastic family dinner. It can also be used to make a delicious soup. Or by roasting with maple syrup, butter, or brown sugar can be a dessert-like dish, which in Farmer Don's book means you get 2 desserts because a vegetable can't count as a dessert. This is the last of the acorn squash for the year, so enjoy! The Spaghetti Squash is a very unique vegetable, a cross between string cheese and pasta, with a mild flavor. When you roast the squash in the oven, cut it in half and roast flesh side down for 30-40 minutes at 450 degrees, you can then scrape the squash flesh with a fork and it separates into spaghetti like strands of squash. These can be then eaten with pasta sauce as a delicious meal! This is the last of the spaghetti squash for the year, so we recommend preserving them for the winter by curing them! Lots of peppers this week! This week we have bell peppers, lots of jalapenos for more jalapeno poppers, cayenne, and some large stuffing peppers (ancho and anaheim). For those of you who don't like hot peppers, we definitely recommend these. Try making Chile Rellenos, you grill the pepper, let it "sweat" out its heat in a plastic bag, then peel off the skin. This makes the peppers much much less hot and delicious when filled with cheese and fried! We've got bunches of Italian Basil, Lemon Basil and tarragon this week, enjoy! to warm you during this cold fall weather we've been having--beets, carrots, and new this week, celery! 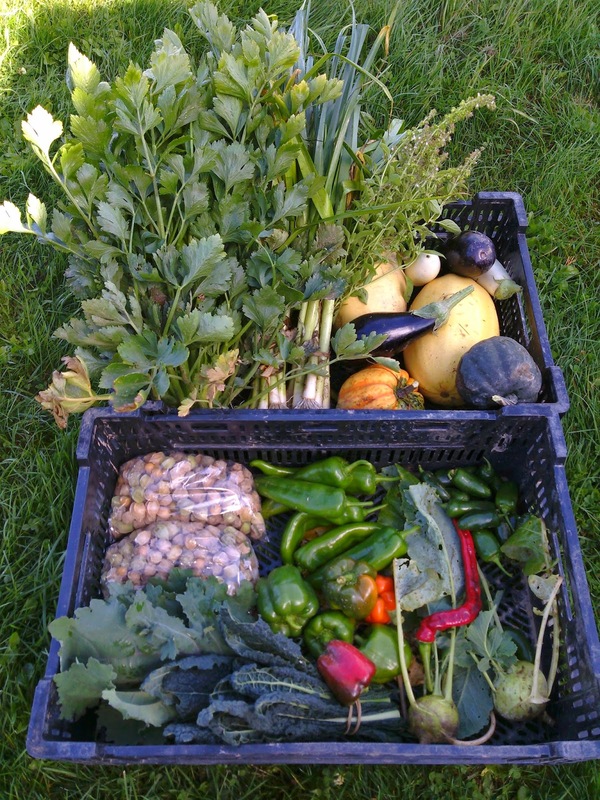 Lots of greens, peppers, and winter squash. This week is the last of the delicata squash, so enjoy! NEW THIS WEEK!Celery is used around the world for the crisp leaf stalks, though in Europe it is more common to grow it for its bulb. The leaves are strongly flavored and can be used as a flavoring in soups and stews or as a dried herb. Celery can be stored for up to seven weeks in the fridge. Celery, onions, and bell peppers are considered the holy trinity of Cajun cuisine, or, try celery, onions, and carrots for the base of a great soup! Beets this week! Try them grilled, boiled, or roasted. We like them best shredded raw on a salad! This week we have a mix of greens from the farm, including spinach, arugula, romaine, and bibb lettuce. These orange delights are a very popular vegetable. They are wonderful, and sweet, when eaten raw. For a real treat try glazing the carrots with stock and butter, yum. This week we have orange and purple carrots for you to enjoy! The Delicata Squash is a variety of butternut squash. It is an easily prepared vegetable, no need to peel this squash, with a rich taste that is ideal for Roasting or being caramelized. The roasted squash recipe below is absolutely delicious and super simple! 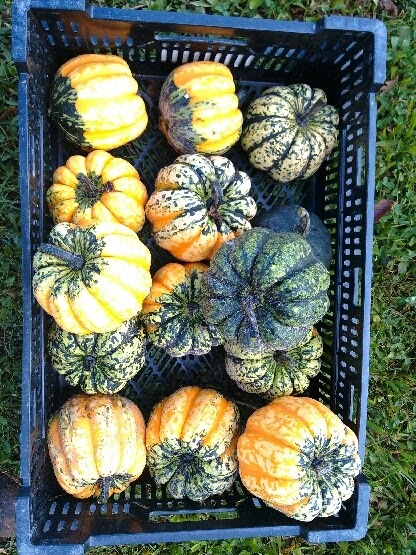 These are the last of this squash for the year, so enjoy them now or cure for storage! The Spaghetti Squash is a very unique vegetable, a cross between string cheese and pasta, with a mild flavor. When you roast the squash in the oven, cut it in half and roast flesh side down for 30-40 minutes at 450 degrees, you can then scrape the squash flesh with a fork and it separates into spaghetti like strands of squash. These can be then eaten with pasta sauce as a delicious meal! We've got bunches of parsley, Italian basil, and catnip this week, enjoy! 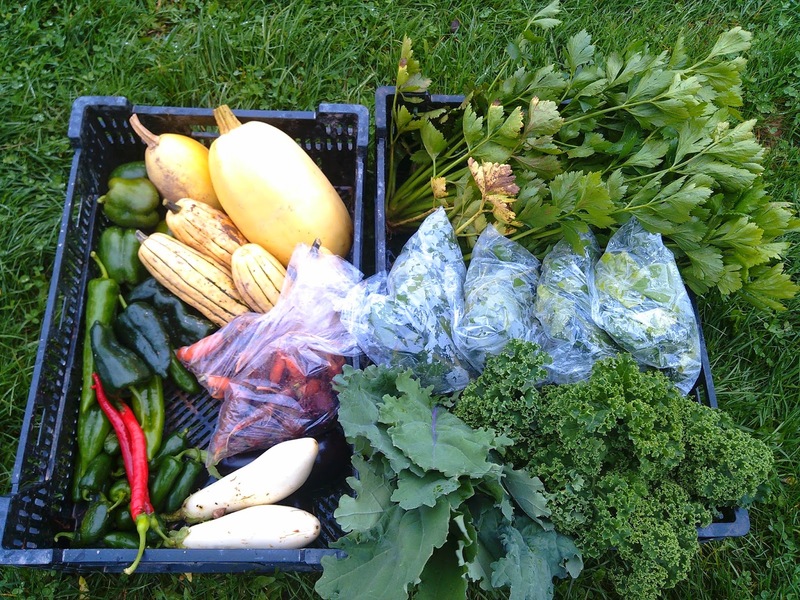 So far we've dodged getting hit by a frost, so the garden still has plenty of produce for our shareholders! New this week is butternut squash and a return of some cold season crops like lettuce and green onions. Enjoy the last of our summer crops, this is the last week for garden huckleberries, butternut squash, and watermelon! NEW THIS WEEK! The Butternut Squash has a sweet, nutty taste similar to a pumpkin. It can be roasted, toasted, grilled, pureed for soups, or mashed and used in casseroles, breads and muffins. Seasonings recommended are nutmeg and cinnamon. The seeds can be eaten raw or roasted. We also have more Green Onions this week. This is a great addition to many dishes. Raw it can be added to a salad or salsa. Also add it at the end of any stir fry for a great infusion of flavor. You can also add it to any soup, baked pasta, or any other dish. This week we have a mix of greens from the farm, including baby kale, mizuna, spinach, arugula, romaine, and bibb lettuce. This is the last of the watermelon for this year, so enjoy it while you can! This week we have a mix of varieties for you to choose from--Moon and Stars, Crimson Sweet, and the white-fleshed Cream Saskachewan. Lots of Jalapenos this week! This is a great week to try out some appetizers like stuffed jalapenos or jalapeno poppers. We have more bell peppers this week and cayenne peppers for you all to try. These are hotter peppers, though not the hottest out there by far, try adding it to some curry or a stir fry for some extra heat, or dry it for some seasoning! Like the Ground Cherry, this unique annual fruit it is related to the tomato plant. This fruit is not very tasty raw and requires a little work to make this the delicious specialty it is meant to be. It is great to use for Jams, on Ice Cream, or in a pie. It has a slightly spicy flavor to it, a bit like a huckleberry meets blueberry. We've got bunches of parsley and Lemon Basil this week, enjoy! This week on The Shire fall is truly here. The air has taken a chill and in the course of a week Farmer Figgins has gone from shorts and tee shirts, to jackets and Carhartts. To match this we have more fall crops coming your direction this week. Many which with a little effort can be preserved for months to come. New we will have the first wave of winter squash, some sunflowers ready to be hung and dried. We also are including a bulk of garden huckleberries, which are an easily preserved crop, so take advantage this week. NEW THIS WEEK! These beautiful squashes are as good to eat as they are to use as a fall decoration. The acorn is a rich squash that is ideal as a side dish along a nice roast chicken as part of a fantastic family dinner. It can also be used to make a delicious soup. Or by roasting with maple syrup can be a dessert like dish, which in Farmer Don's book means you get 2 desserts because a vegetable can't count as a dessert. NEW THIS WEEK! The Delicata Squash is a variety of butternut squash. It is an easily prepared vegetable, no need to peel this squash, with a rich taste that is ideal for Roasting or being caramelized. NEW THIS WEEK! These once beautiful giants, are ripe with seeds. Save yourself from the expensive and less healthy snack and make your own roasted sunflower seeds. The First step is hanging your sunflower upside down and tieing a plastic bag over the head allowing the dried seeds to collect. At which point you boil the seeds with salt and then roast in the oven for a favorite snack. This has been a surprisingly popular crop. This interesting garden specialty is from the tomato family, and luckily has so far been unaffected by the blight. These small paper covered fruits have a super sweetened tomato flavor, which is closer to a strawberry and has the smell of cantaloupe. They are fantastic added to vanilla ice cream. They also can be the basis for a great pie or jam which can be found on Mother Earth News. These Small white turnips are great for use raw in salads, or can be roasted, boiled and mashed, or diced and added to a soup. This vegetable is a staple food that can be used in every meal and many ways let us know what your favorite way to eat them are! Okra was a new vegetable to us last year that we brought back again this year. We like to use our Okra by dicing it with a jalapeno and add it to a cornbread mix. Okra can also be grilled, sauteed, fried, stir-fried, or added to soup. We have a mix of peppers this week either a Jalapeno, Ancho, or a Anaheim pepper. Each has a little different use. Jalapenos, are typically added for spice to a dish, especially salsas, sauces, and stir-fry. Ancho peppers are pretty diverse and can be used diced, or stuffed and roasted. We have changed up the salsa verde recipe this week, it is a fresh recipe that requires no cooking. This salsa is great on pork chops! This interesting vegetable is related to the tomato and must be removed from it's papery husk before use. It can be used in many of the same ways as a tomato either in sauces or green salsas. We've got bunches of Terragon, Dill, Italian Basil and Lemon Basil this week, enjoy!